Employees are the heart and soul of your company: keep their hearts and souls 100% with group health insurance. We specialize in connecting eligible employees with the ACA/Obamacare Marketplace coverage, including helping those who may qualify for subsidies discover options that will provide the best insurance for the fairest price. Employees will find budget-friendly group medical insurance to meet their health care needs, you’ll establish your business as serving up some of the best corporate health insurance around, and continue to attract top talent. And when it comes to employees that aren’t eligible – any part-time contractors or the like – we’re still here to help. Even if your small business group health insurance can’t cover them, BuyHealthInsurance can help identify the best plans for early retirees, COBRA-eligible situations, and new hires in a waiting period, as well as Medicaid and CHIP options for part- and full-time workers. Give your employees peace of mind, so they can focus on what matters. With BuyHealthInsurance, your employees gain access to all the same plans at the same prices available at HealthCare.gov or their state marketplace, including access to government subsidies. The difference is, with us, they have a guide through an often confusing process. Employer health insurance isn’t always easy to navigate, so we’ve done all the work to make things as simple as possible. Your employees will receive reminders and tips for how to use their new insurance, support by phone, email, or chat year-round, and a host of add-ons to make their lives easier and provide discounts where they need them most. Plus, even non-eligible employees get our support in working through a confusing process and identifying their best health insurance options. Enjoy access to a dedicated dashboard which provides real-time enrollment reporting. Get custom marketing materials that inform your eligible employees about BuyHealthInsurance and their Marketplace choices for company health insurance. 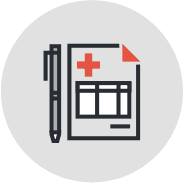 Imagine: outsourcing corporate health insurance to capable, affordable, and enthusiastic team? That’s what we’re here for. And we can’t wait to meet you all.